» The President of the Republic of India is the Head of State of India and the Commander-in-chief of the Indian Armed Forces. » The President is indirectly elected by the people through elected members of both the Houses of the Parliament of India, the Legislative Assemblies of all the states of India and the Legislative Assembly of the Union Territory of Puducherry, as well as, the Legislative Assembly of the National Capital Territory of Delhi and serves for a renewable term of five years. » The oath of the President is taken in the presence of the Chief Justice of India, and in his/her absence, by the most senior judge of the Supreme Court of India. » The President resides in an estate known as the Rashtrapati Bhavan (which roughly translates as President's House) situated in Raisina Hill in New Delhi. The presidential retreats are The Retreat in Chharabra, Shimla and Rashtrapati Nilayam (President's Place) in Hyderabad. » The Constitution of the Republic of India (Articles 53, 74(2), 79 & 111) gave the President the responsibility and authority to defend and protect the Constitution of India and its rule of law. 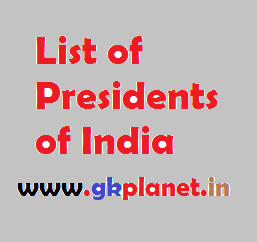 » This list is numbered based on Presidents elected after winning an Indian Presidential election. » The terms of Varahagiri Venkata Giri, Muhammad Hidayatullah, and Basappa Danappa Jatti, who have functioned as acting presidents, are therefore not numbered. » The youngest President to assume office was Neelam Reddy, who was inaugurated at the age of 64 years, 67 days. The oldest President to assume office was K.R. Narayanan, who was inaugurated at the age of 76 years, 271 days (according to his official birthday of 27 October 1920). » The longest-lived president was Ramaswamy Venkataraman, who died at the age of 98 years, 54 days. The shortest-lived president was Fakhruddin Ahmed, who died at the age of 71 years, 274 days. » The President of India does not represent any political party. Prasad, from Bihar, was the first President of independent India, and also the longest-serving President, for 12 years. He was also a freedom fighter during the Indian independence movement. Prasad was the only president to serve two terms in office. Radhakrishnan was a prominent philosopher and writer and also held the position of vice chancellor of the Andhra University and Banaras Hindu University. He was also made a Knight of the Golden Army of Angels by Pope Paul VI. He received Bharat Ratna award in 1954 before becoming the President. He was the first President of South India. Hussain was vice chancellor of the Aligarh Muslim University and a recipient of Padma Vibhushan and Bharat Ratna. He died in office, the first to do so. He was also the shortest-serving President. He was also the first Muslim President. He was elected Vice President of India in 1967. Following the death of President Zakir Hussain, Giri was appointed as Acting President of India. He resigned in a few months to take part in the presidential elections. Hidayatullah served as the Chief Justice of India and was also a recipient of the Order of the British Empire. He served asActing President of India until the election of Giri as the President of India. Giri is the only person to have served as both an acting president and president of India. He was a recipient of the Bharat Ratna and has functioned as Indian Minister of Labour and High Commissioner to Ceylon (Sri Lanka). Fakhruddin Ali Ahmed served as a Minister before being elected as president. He died in 1977 before his term of office ended, and was the second Indian president to die in office. He was also president during Emergency. Jatti was the vice president of India during Ahmed's term of office and was sworn in as Acting President of India upon Ahmed's death. He earlier functioned as the Chief Minister of the State of Mysore. N.S. Reddy was the first Chief Minister of Andhra Pradesh State. Reddy was the only Member of Parliament from the Janata Party to get elected from Andhra Pradesh. He was unanimously elected Speaker of the Lok Sabha on 26 March 1977 and relinquished this office on 13 July 1977 to become the 6th President of India. In 1942, Venkataraman was jailed by the British for his involvement in the Indian independence movement. After his release, he was elected to independent India’s Provisional Parliament as a member of the Congress Party in 1950 and eventually joined the central government, where he first served as Minister of Finance and Industry and later as Minister of Defence. Sharma was Chief Minister of Madhya Pradesh and the Indian Minister for Communications. He has also served as the governor of Andhra Pradesh, Punjab and Maharashtra. Narayanan served as India's ambassador to Thailand, Turkey, China and the United States of America. He received doctorates in Science and Law and was also a chancellor in several universities. He was also the vice-chancellor of Jawaharlal Nehru University. He was the first President from Kerala, and also the first Dalit President. Kalam was a scientist who played a leading role in the development of India's ballistic missile and nuclear weapons programs. He also received the Bharat Ratna. Kalam was affectionately known as the People's President, due to his extra-Presidential activities. He was the first bachelor president of India and the first Muslim President who completed his term. Kalam died following a heart attack while delivering a speech in Shillong. Patil was the first woman to become the President of India. She was also the first female Governor of Rajasthan.